Born in the beautiful city of lakes (Udaipur- Rajasthan), Archana started dancing at the age of 7 during summer camps. She always loved dancing and music. She made sure to participate in dance routines at various venues, be it her school’s annual day events, college fests or community events. An engineer by profession, dancing gives Archana a channel to express herself to the world. She always wanted learn dancing in a formal setting and learn various dance forms, but did not find the right opportunity until she met Shaira. 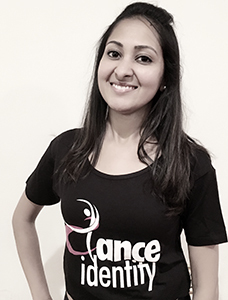 DI and Shaira opened new doors for Archana and gave her confidence and strength to explore her love for dancing, which grows stronger and deeper with her participation in DI. Learning various dance techniques together with forms such as Jazz and Hip-Hop at DI has introduced Archana to her passion yet again. She loves spending her time going through various routines and techniques and improving herself as a dancer. She has been part of the DI team since 2013 performing for various events such as the Google holiday party, Asha Stanford Holi and Chinese New Year celebration.